The Teenage Mutant Ninja Turtles’ greatest foe, the Shredder, is making his return and it all starts in the fires of hell. From San Diego Comic-Con 2018, IDW Publishing has announced Teenage Mutant Ninja Turtles: Shredder in Hell, a new five-issue miniseries set to launch in early 2019. The series will be written and drawn by Mateus Santolouco, one of the defining artists of IDW’s ongoing Teenage Mutant Ninja Turtles series, and will serve as a sequel to the popular Secret History of the Foot Clan miniseries. In Shredder in Hell, readers will follow Oroku Saki as he struggles to survive in the burning hellscape of the afterlife. On his journey, he will discover his true purpose as well as the truth about the powerful beings responsible for both the birth and the death of the world. By the way Sophie Campbell will make the Leonardo Macro (both story and art). Wow! I'm very excited about this. I been waiting forever to see more about the Shredder's connection with the pantheon. I know Kitsune revealed the purpose of her interest with Shredder but I feel like there is more too it. I can't wait for this to come out. Hell yeah, literally! 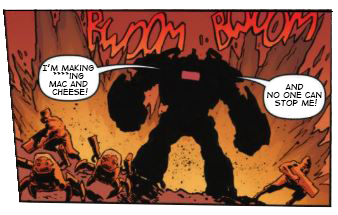 This is exactly what I expected when the first rumblings of Santolouco's new project came out months ago, and IDW didn't disappoint! 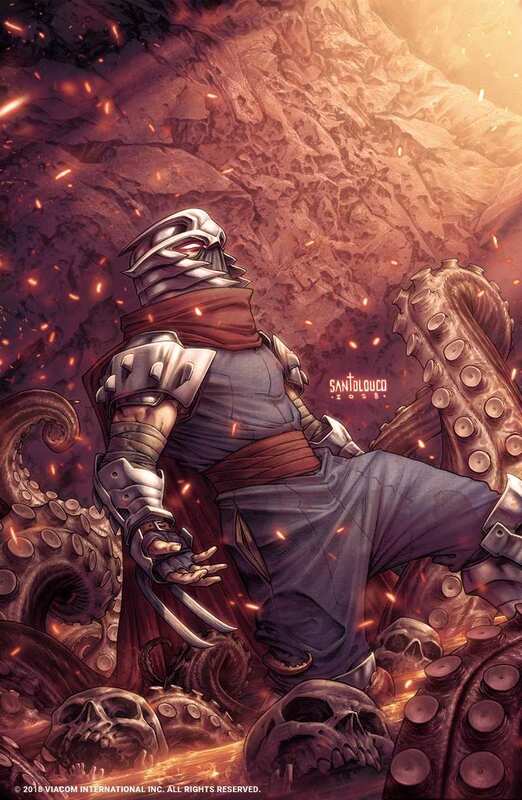 I'm becoming increasingly convinced that Shredder will be ultimately be the spanner in the works of Kitsune's plans. What music should I post?... **** it, I'll post all of it. This reminds me that I need to make a "Seat belts to maximum buckling" gif because this is going to be an e x p e r i e n c e.
Should be cool to see how much of it connects to his mini...and if we'll get a return of that little imp that followed him around there. On his journey, he will discover his true purpose as well as the truth about the powerful beings responsible for both the birth and the death of the world. That is what I'm looking forward to the most out of all of this! The imp might be back too, but the one thing I absolutely expect to come out of this is present!Shredder donning the red oni mask. Last edited by ChosenOne; 07-19-2018 at 01:47 PM. See!? Iam coming back! I told you! So are we maybe gonna see some other dead characters? Saki could have a little father/son reunion. Oh, oh... What if the imp does return and turns out to be one of those "powerful beings" in disguise, guiding Saki's fate all along? I need to go back and re-read the Shredder micro! Damn, I didn’t see this coming. Definitely pleasantly surprised though! Getting Dragonball Z vibes from this, reminds me of Freeza in Hell. Not to mention all those times various characters in the Buffyverse were sent to hell dimensions. Always found it funny villains can roam around hell, even though they were evil in real life and caused the suffering of countless people, and then instead of R.I.P. they're walking around Hell (although they're trapped there), like it's just another day in their life. This is a pretty rad idea. Could’ve been a disaster if they picked other people to do it. It will be interesting to see Santolouco’s skills in writing (I haven’t seen any examples, personally). If it’s as good as his art this series should be amazing.